Welcome to adulthood! It will cost you $949 a month for the next 25 years. The news felt like a slap in the face to Ashley Huntington. Like the tens of thousands of others who graduated in May with debt, her first student loan payment was due this month. "I spent most of my grace period in a blissful ignorance," Huntington said. Federal student loans give borrowers six months after graduation before they have to start paying it off. Huntington graduated from Loyola University of Chicago's School of Law with $125,000 in student loans. 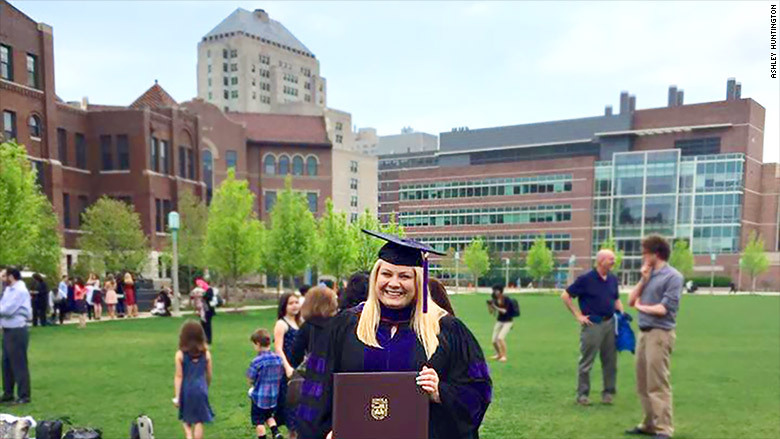 She took on some of that debt getting her bachelor's from DePaul University, but most of it is from law school. "I knew the bill was coming, and I knew it would be large. But I put off knowing exactly how large the bill would be until about a month before it was due," she said. Even if you sat down and did the calculation yourself, there's no way to know exactly how much your monthly student loan bill will be until you choose your repayment plan. And loan providers generally let you wait to set that up until you make your first payment. It was just last month that Huntington's loan provider spelled out how much it would cost her over the lifetime of the loan. "It was a shock, to say the least," she said. The interest will end up costing her three times as much as the principal amount she borrowed. That's if she sticks to paying $949 a month (more than her current rent) over 25 years, but she's hoping to pay more once she gets a raise. For now, she's cutting back on some expenses in order to make the payments. She enrolled at a cheaper gym, canceled her music streaming subscription and is eating out less. She's also making an effort to use public transportation more. Huntington doesn't regret borrowing for her degrees. She has a job she likes as a health law consultant that she could not have gotten without her law degree. She admits, though, that she didn't think a lot about the cost when she enrolled. "I was told that this is something you do -- take out loans. It always seemed like tomorrow's problem and one that wouldn't present itself for a very long time," Huntington said. Still, her debt load isn't as heavy as it could have been. As an undergrad and law student, Huntington held several part-time jobs so she could avoid borrowing even more money to cover the cost of living expenses. If it feels like you won't be able to make your student loan payments, don't panic. Lenders must offer options to federal loan holders. If you didn't actively change your payment plan, you were probably defaulted into the standard 10-year plan. But you should be able to change your plan twice a year. The best thing to do is to call your loan servicer first, said Betsy Mayotte at the nonprofit group, American Student Assistance nonprofit. They'll be able to tell you what your options are. But for now, here are some quick tips. You can apply to "defer" payments on your loan for up to three years, and the government will pay interest for you during this time for certain kinds of federal loans. If you don't qualify for deferment, but are having trouble making your payments -- maybe because of an illness -- you can apply for "forbearance." But your interest will continue to accrue. Maybe you haven't landed a career-track job just yet. If that's the case, you can apply to reduce the amount of your monthly payment. By how much? It depends on your income and how hefty your debt load is. It could be as low as $0. 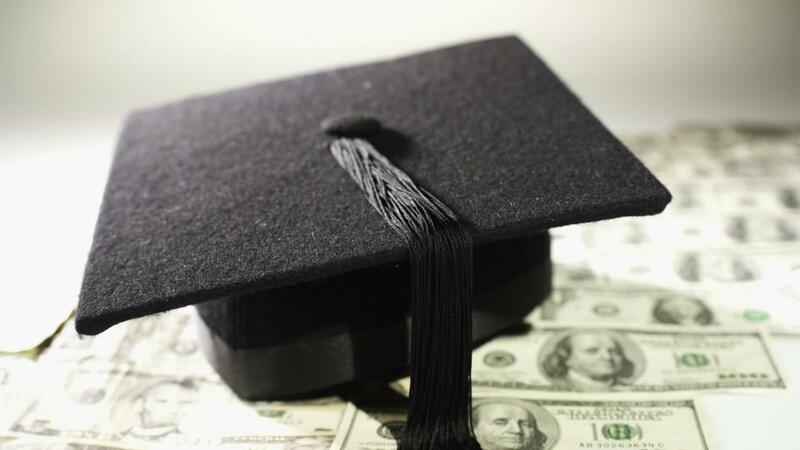 It's difficult to get student loans discharged, even in bankruptcy. But there are other ways -- besides death -- to get them wiped away. In some cases, like the "income-based repayment" plan, any outstanding debt remaining after 25 years of consecutive payments will be forgiven. Newer borrowers could be forgiven after 20 years. If you work for a nonprofit or the government, outstanding debt will be wiped away after 10 years of consecutive, on-time payments. Teachers at low-income schools can get as much as $17,500 for their student loans after working there five years. If you sign up to make your payments automatically, your lender will reduce your interest rate by 0.25% on some loans. Refinancing to get a lower rate could be a good option, especially for grads with good credit and a solid income. It could slash you monthly payment and save you money in the long-term.